Paired with a zesty dipping sauce, potstickers make an irresistible appetizer, side dish or light meal. 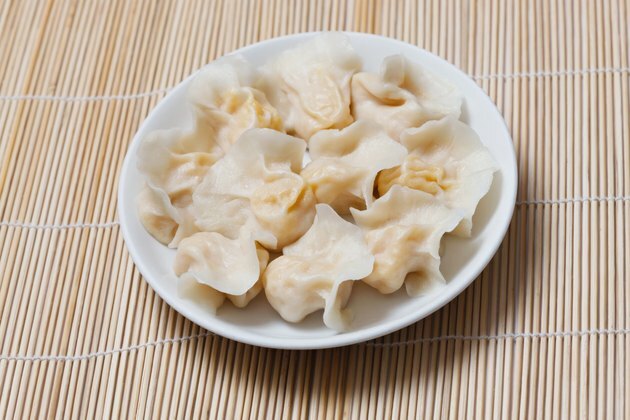 Buy already-made dumplings in the freezer section of grocery stores or Asian food stores, and keep them on hand for a quick snack or to serve unexpected visitors. Although these meat-filled dumplings are traditionally pan-fried on one side, baking them gives you a delectably crispy texture without the oil needed for pan-frying. Line a baking sheet with parchment paper or lightly grease it with cooking spray to prevent the potstickers from sticking. Heat the oven to 350 or 400 degrees Fahrenheit. Keep in mind that potstickers baked at lower temperatures need to stay in the oven longer than those baked at the hotter temperature. Arrange the potstickers in a single layer on the baking sheet, allowing approximately ½ inch of space between each dumpling. You may brush the top of each dumpling with a very light coating of vegetable oil to help them crisp and to replicate a bit of the flavor that you would get from frying. Bake the potstickers for 10 to 12 minutes at 400 F or 15 to 20 minutes at 350 F. Rotate the baking sheet halfway through the cooking time to encourage even cooking. Look for the edges to be golden brown when the dumplings are done. Prepare a dipping sauce while the dumplings are baking. Combine ingredients such as ginger, chili sauce, rice vinegar, soy sauce, sesame oil, and lemon or lime juice in a small bowl. Whisk the mixture together and set aside. Remove the potstickers from the oven. Transfer them to a plate or serving platter and serve them with the sauce on the side. Check the internal temperature of the potstickers to be sure that they are cooked thoroughly. Once the filling reaches 160 F, the dumplings are done and ready to serve. If you want potstickers that are crisp on one side yet tender on the other, allow the potstickers to bake for about five minutes to become golden brown on the bottom. Then pour some water over the top of the dumplings, cover the baking sheet with foil and let the potstickers steam for five to eight minutes. This method replicates the more traditional method of pan-frying the dumplings.